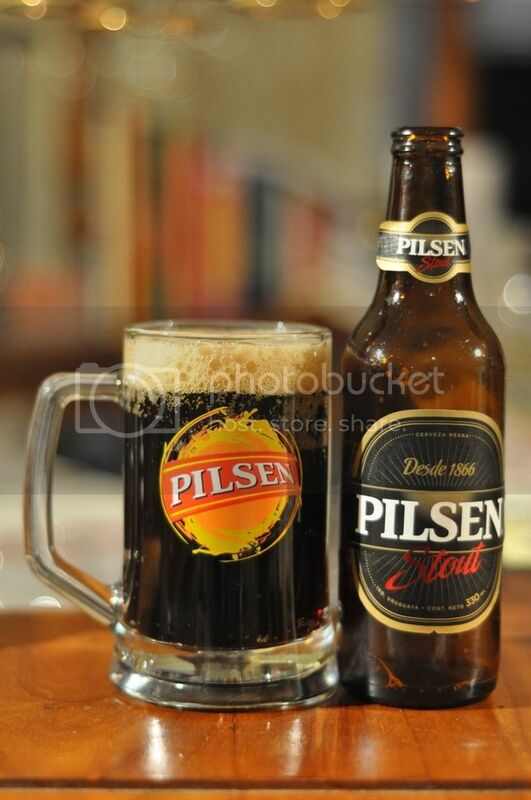 My second ever Uruguayan beer is the Pilsen Stout again provided by Sergio. It's quite cold here and this was one of the very few stouts I had in the fridge. If this is half as good as the Pilsen I had a couple of weeks ago, I'll be happy. Export (or Foreign) Stouts are most popular in warmer tropical parts of the world, where they are often the most popular beer in the country. Basically they are slightly thinner in body with a larger malt content and higher ABV than traditional stouts. Pilsen Stout pours a dark brown colour with a light brown airy head. The beer has hints of red that dance around as you hold this beer up to the light. There appears to be a lot of carbonation present for a stout, however the head retention is almost non-existent, fading very quickly to nothing. It actually has a very similar appearance to Coca-Cola, with a bit less carbonation. This one doesn't really look like an export stout. When you smell Pilsen Stout you can already tell that this beer isn't complex at all. The nose is very weak with only hints of roasted malts. I can't detect anything else... There are no balancing hops on the nose, there's no caramel or molasses flavours that a complex stout would have, there's just nothing else going on. At least it doesn't smell bad. As you start drinking this beer you begin to get an understanding of why this beer looks and smells like it does; it's not an export stout. It's a dark lager or some description, it has a thin body and not as much carbonation as it appeared, but a more than adequate ammount. The roasted malts are done really well and are incredibly tasty and there is some (very mild) hops that balance this beer quite nicely. This is one of the easiest drinking dark beers you are likely to come across, and it taste good as well! Pilsen Stout doesn't have a complex flavour and if we are being honest it probably isn't a stout but what this beer is, is very tasty! I think it's more of a Munich Dunkel Lager stylistically and tastewise as well, it's actually very similar to Negra Modelo from Mexico. Judging by the two mass produced beers I've had from Uruguay, they are a lucky country in terms of their beers and I really should try the other ones I have. If you ever come across this beer it's worth a go, and if you find it tell me where! I want some more.